At first we will learn about ground water control according to IBC. Where it is found that ground water table is at equal or more than 152mm below lowest level of floor (bottom level), the floor and foundation wall as well need not to waterproofed i.e. damp proofing is enough according to recommended material and method of IBC. •	Rated discharge capacity of disposal area In the ground water control system. Again walls that will be treated or constructed should be of concrete/masonry; should be strong enough to withstand expected hydrostatic pressures, along with other lateral pressures/loads that are active in the walls. Here hydrostatic pressure is considered as waterproofing term, when hydrostatic pressure condition dominate in the field and design of ground water control not include or not enough to lower expected elevation (as discussed above). We know due to imperfection of concrete, formwork sealing and improper mixed or proportioned concrete, the surface of concrete member have some defects. 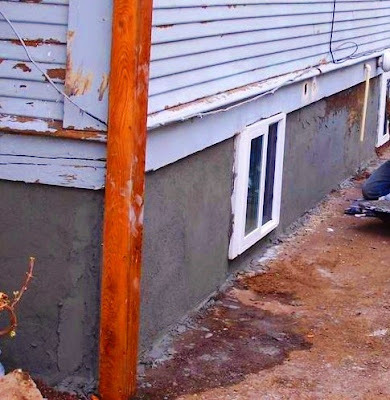 We have discussed many posts about such imperfection of concrete work. However, our concern is here surface preparation; we are not discussing much about imperfection. 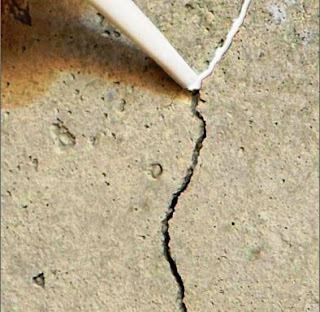 Before applying water proofing materials on surface of concrete walls, the imperfection like recesses or holes appeared after removal of formwork or any types of cracks (if not structural cracks) should sealed using bituminous materials or other accepted materials or method also can be used in this purposes. In case of masonry walls, the exterior walls under ground level should be covered with plaster; may be of cement plaster or with other suitable material. The recommended thickness should be equal or more than 9.5 mm (3/8 inch) when mortar of Portland cement is used. The plaster should used to masonry footing too. Now think about waterproofing, this should be used from top or above of maximum level of ground water table to bottom of wall. 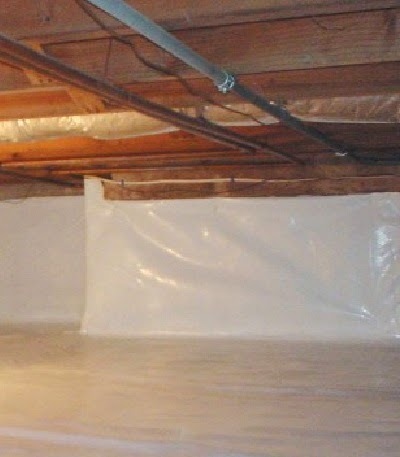 The IBC recommended to keep waterproofing more than 12” above of ground water table. The rest portion of wall should be damp proofed according to IBC as discussed in previous post. Should consists of two ply hot mopped felts, equal or more than 6 mil polyvinyl chloride, polymer modified asphalt of 40 mil, 6 mil thick polyethylene or another approved materials or methods that is capable to bridge non-structural cracks. Sealing and lapping of joints in membrane should be provided according to installation instruction of manufactures. KALMATRON® KF-Jet is designed as a premix to the dry Ordinary Portland Cement (OPC) powder for production of rapid set cement (RSC) and fast setting cement (FSC) with a controlled setting time. KJ-JET offers concrete, which, after application, has twice lower drying shrinkage cracks, higher compressive strength, and adjustable hardening time. KF-Jet’s can be applied as a premix to cement powder by applying 10 kg or 15 kg of KF-JET per 1000 kg of cement to get FSC or by applying 20 kg of KF-JET per 1000 kg of cement to get RSC. Some of the expected results include two to three times lower shrinkage, exothermic heat that is lower by 30 to 50 percent, and no shrinkage cracks, flakes, efflorescence, and dusty spots. • Depending on the equipment and volume of application, please apply pumping pressure gradually from ½ bar until resistance to pumping pressure will be retarded. • Increase the pressure up to two times to get cement slur moving through the hose and needles. • Keep injection moving until the excess cement slur comes up around the needles. • In case bubbles appear around the needles, please proceed pumping for stable result. For job sites with severe pressured leaks, it is necessary to inject KF-JET premixed to cement in a ratio of 1:10 in a dry form. Air pressure of the compressor transporting of that powder to the source of the leak should be equal to or higher than the original pressure of the leaking water (or any liquid). Many projects goes during of the weekends to be accomplished before next business week. Driveways, loading areas, industrial service floors are the most requested ones. Premix KF-JET allows to get project done with shortest "ready to walk time" and without curing.